I know we have some very, very incredible miniature knitters in our community. Looking at the wonderful knitting classes at Guild School, is there a recommended process for learning to knit and ultimately learning to knit in miniature? I can knit and purl, and did follow the pattern to make a single life size scarf this year. I purchased some Clover Size 0 Long Bamboo needles and the plan was to try this size, and move to smaller, and smaller sizes. Is there a recommended knitting book for life size or mini projects that can be used to learn specific skills? Do you have a favorite DVD that you wished that everyone had these skills? Should a knitting wannabee work on a sampler to create a set of skills? If you are teaching someone in a class room setting, what are the specific skills that you wish your students to show up with? I can knit and purl, and did follow a pattern, have (badly) corrected a few slipped stitches with crochet hook. Eyesight is ok, I do understand how to follow a needlework pattern. Don't always follow the pattern, but I do understand what I'm supposed to do when stitching a petitpoint project. Our local library has a free Saturday knitting club, but if I go they are going to pull me in to life size projects.... so I have not attended, as I really don't need any more distractions for my already fragmented mini distraction disorder that is ever present in my life. I dream of soft, angora type beautiful faire isle sweaters in 1/12th scale tossed over the bed. I have knit only in full size, professionally, back in the day. But in my experience the feel of bamboo needles is very different from steel needles so that might not translate as much as you'd hoped. I'll ask Althea and Christa to try to help out here. Miniature knitting is on my bucket list as well. Lord knows I have enough fine yarn, it's the time thing that snags me up. Hi tamra. I will try to help you. If I understand correctly you did knit in full size. I started knitting in miniature with needles size 1.2mm and dmc80. Then needles 1.0mm(I am sorry I don't know the us size). And my sweaters are made with 0.8mm and venne colcoton. I think that combination will work for you. I do not like making samples. So i started making shawls just to get the feeling and you can combine knit and purl. Than I started to make a sweater that was in a dutch magazine. And now i am trying to knit with 0.5mm. That is still bigger than althea use. I think. I am sorry i think i mean a scarf instead of a shawl. Okay, now that I am settled into the hotel room here in Chattanooga (what a beautiful town by the way!) I can respond. Okay, so, I have some ideas to get you started doing fun little projects which will help you learn to use small needles while at the same time making something cute. Don't think miniatures for now, just think small and cute...how about knitting some flowers? They are really fun and plus, you can use them to applique onto sweaters, purses, whatever. There are plenty of free pattern on the web if you browse. When I was first starting, I found the DMC wool pretty easy to knit with (I can send you a skein if you pm your address) and also crochet cotton (you can easily get this at a hobby store/Joannes). I hate the DMC embroidery thread that you have to split but a lot of mini knitters like that stuff. I'm too lazy to separate threads. I love Gutermann silk but it will be a while before you can use that. Anyway, there are tons of options for you when you are ready. As for the needles, the largest I use is a 5/0 which is 1 mm. I typically use needles that are 8/0 which is .5 mm. I really hope this helps. Don't hesitate to email me if you have any questions. Thanks Bonnie, Christa and Althea for the kind responses. I am hoping that my posting the topic will give others the courage to try this with me. I have DMC Medici; I know the medici is wool, I have lot of Silk Sewing Gutterman 100/3, Tire and YLI size 50 and 100 from petitpoint on higher counts of silk gauze, also have a collection of old antique silk sewing threads. Should I just start knitting on the 1.25 mm steel needles? I can go to the store again, but I think the Bamboo 2 mm needles were the smallest I could find locally; I think I have DMC size 80 cotton thread, that is commonly used for crochet edging for hankies or for tatting. I had purchased needles a long time ago... have sizes .5 mm to 1.25 mm in the stash. I think I'll stitch with wool first, as it has some give, and heaven knows I need some give. Ok, I think I need to focus on combinations of purl and knit stitches and to understand the abbreviations and the flow of the design, next. Christa, I've only knitted one (life size) scarf; I took a 2 session / 2 hour each class March 2014, and I'm glad to say that I did finish my project. There are some mistakes in it; but I'm happy with my gauge and consistency. I'm sure that I'm not ready for scale miniature class; but I am ready to begin the transition to miniature, and to put my time in. I had never embroidered anything in life size, and did manage (kicking and screaming) to get to some ok ability to PP, so I think this will be fun. Christa, is there a specific scarf that you can recommend? Does anyone know if Colcotton is available in the US? My Life size scarf was something like 10 rows of 60 p stitches, then p 10, k 40, p 10, next row p 60, repeat to desired length, 10 rows of 60 p, bind off, and make fringe. Althea, I do have the Dolls and Miniature Magazine with your sweater pattern that you published. I think it all began with this magazine article - the whole falling in love with a tiny little sweater...and wanting to learn how to knit! I've also seen wonderful projects at Guild School by Sue R, and Mavis, that are also in the "exquisite -I-can-only-dream" category to make myself! Sweaters, Sweaters, Sweaters.... I think I can try; I think I can try! Now reality - sinks in, no, flowers, flowers, flowers! pure optimism; sweet! Tamra, if you know K and P and cast on and off, you know how to knit. Everything else is just combinations or variations of those stitches, and how-to videos make learning those variations a snap. Althea's advice to make something simple and fun for practice is excellent. I agree that wool works well for beginners because of its give, and DMC Medici is a good choice. One of my favorite projects for trying out stitches and color combinations is potholders. I used DMC Flower thread for the ones shown. That's been discontinued, but you can find it occasionally, and tatting thread is a good substitute, just not so soft. There are a couple of crocheted ones lurking in picture. I like Colcoton, too, but I don't know of a US distributor. I order mine from http://www.helena-petitefashions.co.uk/ Helena provides excellent service and has many beautiful patterns calling for the finer threads that she carries. Don't try Colcoton until you've worked your way down a little. Many mini knitting patterns don't specify fiber to use because of availability and variations in gauge, so often it's try it and see. One thing you can't do is take a RL pattern and just use smaller needles and finer thread. It just doesn't work. You may eventually find a pattern you like and want to individualize. One of the Xstitch programs is valuable for charting. The graph size can be altered to make each square into a rectangle a little wider than tall to be more like a knit stitch. 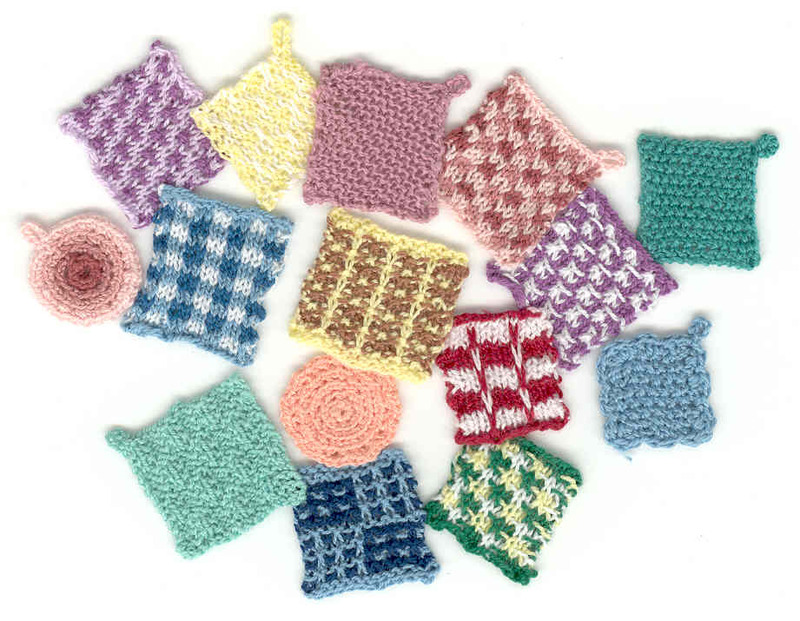 There are patterns for miniature sweater Christmas decorations available. They wouldn't be in scale, but would be a good start, and then could be worked in finer thread when you're ready. Here's one I found online: http://greensandjeans.com/2009/11/14/mini-sweater-ornament-pattern The thing I don't like about patterns like this and many beginner pieces you'll see is that the knitter uses one size needles for the whole thing. You would never do that in RL because the ribbing looks coarser than the plain knitting. Once you've worked your way down, use needles 2 or 3 sizes smaller to work ribbing. You're not going to be ready for .4 mm needles right away, though. The Venus Dodge book Dolls' House Needlework book has a number of patterns for beginner and intermediate knitters. Althea's website, http://bugknits.com has one of the best charts for mini needle sizes, including some sizes that she has made to "fill in the blanks." I make my own needles, too, and my favorite size needle is .75 mm (6/0 or UK size 22) with .4 mm (9/0 or UK size 25) for ribbing. One of the problems for beginning mini knitters is having those tiny stitches slip off the needle. I always have my index fingers right at the tip of the needles to prevent that. When I make a stitch, I make sure it is pulled through and finished before slipping it off the needle. I've sort of rambled as things came to me. Any specific questions I'd be glad to help with. The world of miniature knitters is very select. We'd love to have it grow--join the fun! It's been a long time since I did any mini knitting, but reading this I suddenly remembered another mini knitter who would knit lifelines into her knitting because it's so easy to drop stitches, and so difficult for beginners to pick them up again in miniature. The life line prevented the knitter from losing more than a few rows at most. Unfortunately, I don't remember just exactly what she did to create a lifeline. Do any of you experienced knitters know what she might have done? I started with 0.5mm needles and Gutterman silk or machine embroidery thread, but I had knit in full size for years and already crocheted in miniature, or I couldn't have started that small. I started out with miniature patterns from Althea and other mini knitters, but that was because I don't have patience for anything that's just done to learn skills. Of course, that means that the real patterns often didn't turn out right, but when they did, I was thrilled. This is just to say you can start however you're most comfortable, and in whatever way won't discourage you. One note about DMC is that it splits very easily. Simply unwind the skein, grab one strand with one hand, the rest of the strands with the other, and pull. It will look like a tangled mess, but it will straighten right out. I prefer wool for larger knitting because of the give, but I found that it split badly in miniature and started using only cotton or silk. I think casting on in miniature is the hardest part (well, that and the first row). Someone long ago in the mini knitting and crochet yahoo group told me an easy way to cast on in miniature. I'll see if I can find what that was, but no guarantees. Maybe one of the experienced knitters knows the easier ways off hand. Once you get started and get into the rhythm, you'll surprise yourself! And like petitpoint, good lighting and magnification is key. Missy suggested a lifeline which I had forgotten about and usually forget to do. I have found it most useful when beginning a new section or establishing a new pattern in lace knitting. Thread a small tapestry needle with a contrasting color and run it alongside the needle through all the stitches (hard to do if you have a very tight tension). Don't remove the stitches from the needle, but just leave that thread there and proceed with your pattern. A new pattern is where you are most likely to make a mistake in knitting. Before that, if you can't easily correct a mistake, it's usually easier to slip those stitches onto a straight pin, put your "work-in-progress" into a basket, and start over. The first row is often the most difficult. Cast on over two needles and then remove one before knitting the first row. You will have an even, but looser tension to work into for the first row. If you use the most common cast on, it looks better on one side than the other. It's a minimal difference in RL, but in mini make the first row the wrong side. You may prefer alternative cast ons you can find in a basic knitting book, Knitters magazine, or online. If you are making a scarf and want the design to look the same on both ends, use a temporary cast on, and work from the middle to the end. Remove the temporary cast on and knit to the other end. I'm glad Missy described splitting DMC floss, because it is very easy, and the color selection cannot be matched. There are a number of lovely silks including overdyed ones that also need to be split. That said, the convenience of working from a spool, like Gutermann and Colcoton, may influence your choice of threads. I'm not ready for .4 mm needles has me rolling on the floor laughing. I showed my husband the .5 mm 8/0 needles today and his response was, that someone saw me coming across the room in Chicago. My smart reply was "No Shipping!" - so is everyone using piano wire and grinding the tips? He said he can find me .5 mm steel wire; so we will see how quickly he comes up with my wire. The 5 steel needles were $7.60, and most importantly I haven't lost them in my house. Their is a train store, about 3 blocks from my house, but they never have anything that I need; they could have piano wire though. I'm worried that I won't have enough length for my wires for my tiny little projects, and I need a bead at the end to keep these lovely little stitches from coming off the bottom end. I have these tiny pearls that I purchased from eBay that are too large for minis, that would probably be great. Oh the split of the DMC Medici does sound like a hazard in the making. I have to go find what kind of flower thread I purchased in Chicago at the 'other' show. I have the Venus Dodge book. I could have pearl ends at the bottom of my knitting needles! I will definitely cast on with two needles. Missy, I live under a magnifier LED light. It never gets put away, and is a permanent fixture for all things fiber related. I do want to learn to do this, so I can be with my fiber friends at Guild School; but I'm not showing up in class until I'm not lost! So I will try and put my time in at home and patiently work through this. I may have to go to the library Saturday classes if I get stuck; but I'm a natural continental knitter, as I have to hold my free thread in my left hand; does anyone see this to be a problem with mini knitting patterns? I know my local teacher didn't seem thrilled that I insisted using my left hand to control my thread. No, don't try to split DMC Medici, Tamra. It's fine as is, but not on 8/0 needles either--more like .8 mm. The separating technique is for pulling out one strand of floss from six. I wouldn't recommend piano wire either. I used it when that's all I could find, but it tends to leave your work grey, and can even rust. You definitely can make your own needles. I have an instruction sheet for doing just that. If I haven't already posted it here, I will. Sue Krzysko discovered that the little soft plastic earring backs work well for the ends of needles. I may use them for a fairly large piece when I put it down, but never need them while I'm working. If you glue an end on (your pearls), you cut down the versatility of your needles. Personally, I would never buy needles that already have something on the end. You may need double-pointed needles someday. Speaking of Sue Krzysko, she should be on here, too. She probably doesn't think so, but she has a great deal to offer other mini knitters. If you already have flower thread, try it. DMC was so nice, but the other brands work, too. Some are a little fluffier. Danish Flower thread is especially nice. I admire your using the continental method, Tamra. When I taught my daughter RL knitting, I insisted that she learn the continental method, and she is twice as fast as I am. I learned how to do it, but it is not natural to me, and I don't use it for mini knitting. If you can hold a thread in each hand, you'll be a whiz at Fairisle. I can't imagine a teacher discouraging it. You may need to tighten your tension a little more than you are used to, as work done with the continental method is usually looser. Hi. I don't use the continental method either in miniature. But only because I learned it the other way when I was young. But I am making fair isle in miniature and now I am trying it the continental way because it must be easier and faster. Well people tell me it is faster. My sweaters with color patterns I am still knitting it with the thread in my right hand. So I don't think you will have a problem to use continental knitting in miniature. I even think it will benefit you in my class. I am als curious what method Althea use. Progress: I just placed an order with Helena for Venne Col cotton 70/2... and spent way too much time on the lacis website tonite. Also purchased some DMC flower thread on eBay. You are going for the very fine thread? Good for you! I hope you like it. For my sweaters in class I will use the 34/2. But with 70/2 it wil be very beautiful. Christa, I ordered supplies as we just don't know how long it will take to actually get them. I'm going to get my DMC Medicis out of my closet; I know where it is, and will start with wool, and stitch something simple - very simple. But I wanted to place the order for the mohair, as I just see fuzzy fair isle sweaters in my head, because a) I don't know any better! and that is what I wear, soft angora fair isles, and I thought I would order some mohair, and the venne col cotton may also be worth a go. Perhaps the DMC flower thread will work for a blanket. Some of us just have to work through the fuzzy mohair experience so we don't want to do it again; I think it will split easily and I'll might be doing a lot of muttering. I was knitting in my sleep last night . I know when I'm working in my sleep, my brain is telling me that I need to do this when I'm awake to put my mind at rest. One of my lurking Petitpoint friends from Canada, Marianne,, also emailed and reminded me of Sharon DeVries' (IGMA Fellow) blog, so I was lingering there last night too. I loved reading all of her tips. She illustrates so nicely the end results of using different threads, it is similar to Sue in Mesa's sample card of the results of different threads. I do like the sampler idea. It just speaks to me as a stitcher, a wannabee knitter, and wannabee weaver - even though I've never made sampler in Real Life, I just love the idea to give me a basis for my skill set. Oh yes, I do have my bobbins so the venne cotton can be used for bobbin lace, although I'm pretty sure I would probably use silk for bobbin lace. One thing about the fuzzy stuff is that if it is too fuzzy, it will look wrong in the small scale--too much fuzz. I have some extremely fine wool that I got from Lacis years ago--it's the finest I have ever seen. I don't think they sell it anymore. I would be happy to send you some if you want, just message me your address. As for what method of knitting I use, it is the English method that I am most comfortable with. I did teach myself the continental method and sometimes use it with fairisle, but I am hopeless with it when it comes to the purling. Sue suggests pot holders which is a brilliant idea for doing quick and easy projects...I noticed in her pictures that several are slip stitch color work patterns which is a wonderful way to get a color work pattern with only one color per row. Have fun! So glad you are getting into the knitting!! Careful, it can become an obsession!! Yes, I know the scale thing is clearly an issue... but Barbie may need a nice fuzzy - weird shaped , first- thing- I- knitted in mini sweater. The little potholders definitely speak to me, and I got the flower threads in the mail today. I can also knit them as Christmas Ornaments and make mini pompoms for the sweater. Oh goodness, I could easily be confused. To illustrate how "green" I am, (sam I am), if I'm holding the free thread with my left hand which method is this? I'm watching the videos next. The continental method is with thread held in left hand. Like Althea I am less comfortable purling with that method. I have not heard the other method (yarn in right hand) referred to as European method, but I don't really know the name for it. Of course, we're referring to right handed people in these descriptions. Left handed is the continental AKA German knitting method. I've heard this referred to as "picking" the yarn. I knit with the yarn in my right hand--English style. They sometimes refer to this as "throwing" the yarn. Continental is easy for me as long as I am knitting but for the life of me I cannot do the purling with the thread in my left hand. I'm relieved that I did get a term "Continental" correct, its hard to communicate if you are not using the right term, fuzzy fiber, fuzzy brain, yep, yep, yep. I wonder if "throwing" the yarn is similar to "throwing" a shuttle in weaving. Bonnie, do you have any insight on the common use of the term? Being a crazy miniaturist I took my first life size knitting class and the weaving class this year in my little community...my year of breaking out and trying new stuff, all so I wouldn't totally lost when I show up at Guild School. I can imagine the knitted flowers on a sweater, or a drawstring purse. I think I get the videos for the slip stitch; will have to try it. It all starts with casting on! Hmm, I have never heard of continental knitting before, I was taught to hold the free yarn in my right hand and have always knitted like that, being right handed of course. As a ten year old we were taught knitting in school, we knitted a set of clothes for a doll and I can remember how proud I was of my doll's finished clothes. Cross stitch was also something I was taught in school at about the age of eight, somewhere I still have that piece, a red seahorse on a piece of blue Aida fabric. Many years ago I taught a left handed person doll making, it especially got interesting when I had to teach her some heirloom hand sewing techniques for the clothes, I had to think hard about how a left handed person would hold, stitch and etc the fabric. I have been enjoying this thread on mini knitting very much, I have done a bit of mini knitting from the Venus Dodge book, just not enough time to do everything, a universal problem I believe. I'm pretty sure the term "throwing" the yarn in the yarn-in-right-hand method comes more from the motion made to get the yarn around the needle for the next stitch than any connection to weaving shuttles. But I'm so pleased to hear that other knitters I admire can't master continental style either. I've tried several times (full sized) to pick up speed but give up and go back to how I was first taught. When I've taught knitting to lefties I find directions with lots of illustrations, scan them and use a photo editor to flip them. Using that as a guide I can knit left handed long enough to get them started.